♥ So cute !! 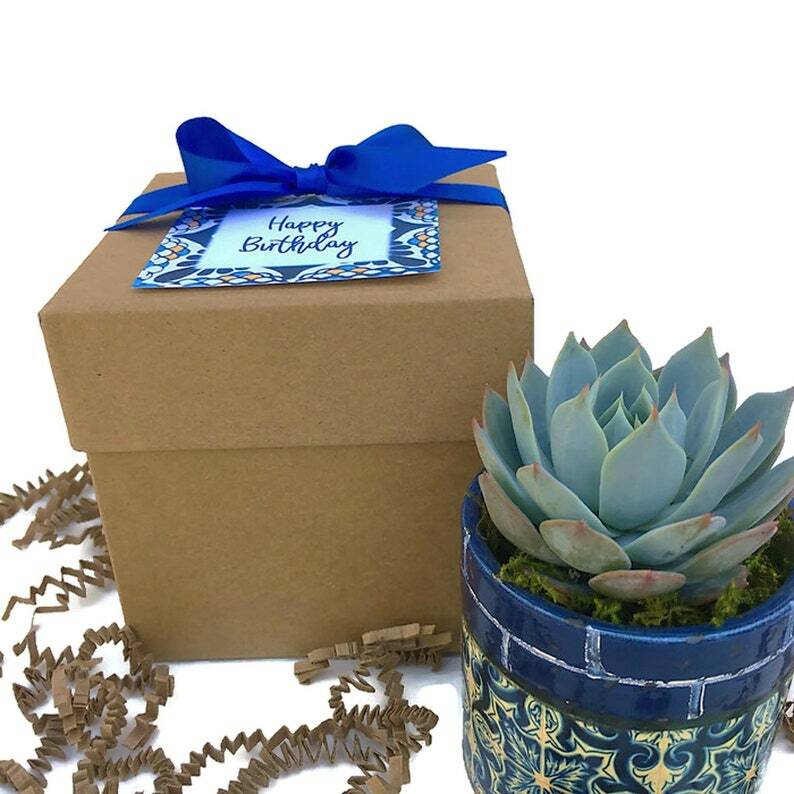 ♥ This beautiful ceramic succulent pot with white spanish tile pattern is gift wrapped in a Kraft box, tied with blue ribbon. The gift tag can be customized for any occasion. - limited quantity available, get yours now! ♥ 1 ceramic planter with rustic blue spanish tile pattern. Planter is approx 2.5" W x 3" tall. ♥ includes a small gift card - let us know what to print on the card for you! if no text specified, we will include the "Happy Birthday" card as shown in the pictures. Please keep in mind that each pot is handmade and slight variations do occur - each one is unique and made with love. Arrived exactly as described. Simply beautiful and highly recommend. Such a cute little gift!! The succulents were perfect and beautiful. Seller was very nice and my order shipped quickly. Highly recommend!! Order arrived very quickly. Seller responded to questions very quickly as well. My sister loved the gift. Dirt did get spread around in the box a bit, but I’m not sure this is avoidable. Due to the custom and living nature of our products, refunds are not offered unless an error was made by us. We always make sure to ship all plants in excellent condition. if there is a problem or an item arrives damaged, please notify us via Etsy conversation within 48 hours of delivery and send pictures of the damage. We will do our best to resolve the situation. Unfortunately we cannot refund the shipping costs. No refunds on custom orders. -If an item is returned to us (i.e. if item is not picked up by recipient after post office left a pick up notice, incorrect or in-complete address was provided, or if an item is 'refused' by the recipient) – this is because it takes too much time to return to us (returns typically take 10 days minimum to be shipped back to us, by that time the plants are typically dead or in very bad shape). Please be aware of climate conditions in your area at the time you order. Most succulents will die if exposed to temperatures below 35-40F. Heat packs are available to include in your shipment. We cannot be held responsible for damage in transit due to cold, extreme heat or USPS delays - ship at your own risk (even with heat pack). Please note: the heat pack will not protect succulents from freezing if left on a porch all day at temperatures below freezing. If you are not able to take your delivery in immediately, please consider shipping it somewhere so that it will not sit out too long and freeze. The shipping costs are automatically calculated at checkout based on the zip code of the shipping destination provided, and includes postage, delivery confirmation, online tracking, packaging/handling and standard $100 USPS insurance (priority mail). You will receive an email notification with a tracking number when your order has shipped, please track the order once a tracking number is provided. We use USPS for most orders. It usually takes approx 3-4 business days to arrive depending on your location, however these times are NOT guaranteed by USPS, If expedited shipping is needed, please contact us for details prior to placing your order. We clearly label every shipment as fragile and have no control over your shipment once it has left our hands. We are NOT responsible if the package is sent to the incorrect address. We ship to the address indicated on your order, unless otherwise communicated to us. Please make sure you provide us the correct address. We cannot replace items that are marked 'delivered' at our cost. Please note that most succulents change color depending on sun exposure and stress, therefore the succulents you receive may look slightly different from the pictures in our listings - no 2 plants are the same! Some soil may come loose during shipment. Yes! They are real beautiful living succulents. Enjoy them grow as you take care of them. Almost all of our items are already gift wrapped and will arrive as shown (with the exception of certain of the supplies). For some items an option to gift wrap is available from the drop-down menu at checkout. Care instructions are included with each item. 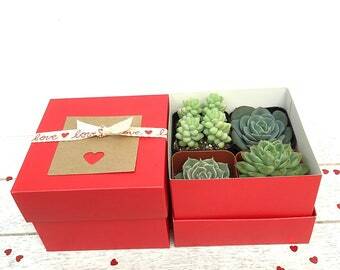 We highly recommend opening and unpacking the shipping box on arrival to ensure the succulents get some light and look their best. Succulents do not like to be left in the dark. What is a heat pack and do I need one? If you are ordering for delivery to a location with temperatures below 35-40 degrees, please add a heat pack to be placed in the shipping box to keep the plants happy (and avoid damage/freezing). This option is available at check out. What does 'SHIP date' mean? Our shop is set up so that you can select the preferred ship date at checkout. We did this so you can plan for your order to arrive close to a certain date. The 'ship date' means the date we ship your order. it should arrive approx 2-4 days after the selected ship date. Please also note that the date you select is when we will ship your order (unless otherwise agreed upon by message). 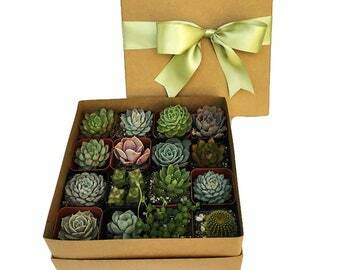 We use USPS Priority Mail for all orders containing plants. It usually takes approx 2-4 business days to arrive depending on your location, however these times are NOT guaranteed by USPS, If expedited shipping is needed, please contact us for details prior to placing your order. If you live in San Diego or Orange County, you can also pick-up your order(s). Please send us a note and we will set up a listing with free shipping.